Experience Continental's authentic Chicken Green Curry which is made with a delicious blend of real herbs & spices. Learn how to create this dish today. Sugar, maltodextrin, milk powders (cream, skim milk), corn starch, vegetable powders (onion, garlic), salt, mineral salts (451,452,508), natural flavours, lemon grass powder, coriander seed, fish powder, sunflower oil, chilli powder, spinach powder, yeast extract, hydrolysed soy protein, food acid (citric). Contains naturally occurring glutamates. Allergens:Contains milk, soybean and fish products. Made on equipment that also processes products containing wheat, peanut, egg, sesame and crustacea. I am very fond of this brand of thai green curry and have been unable to source it at our local supermarkets. can you please tell me where I can purchase it. I have tried the masterfood one and it is nowhere near as nice as continental. Hi Glenys, sorry to break it to you buut our Chicken Mild Green Curry has been deleted from the range due to poor sales & low distribution. please bring back mild green curry chicken. My partner has been searching everywhere for it and i had to break it to him that it has been discontinued. One very unhappy man. 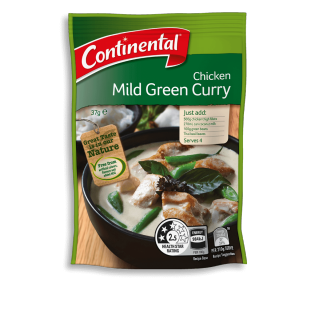 Its strange that the only two Continental packet mixes i use regUlarly, Chicken mild green curry and Beef and red wine casserole have been Discontinued. We really love them and Im at a loss to find why they would be discontinued ? So sad,why? Hi Annie, we are very sorry to hear that these product deletions have caused such sadness, this was certainly not our intention! Products are often deleted due to poor sales or to make way for new exciting products. We will pass your request through to our marketing team. Hi, sorry to disappoint you further but yes it has been deleted from the range. Sorry to be the one to break it to you but our Chicken Mild Green Curry has been deleted from the Continental range.